Do you get confused while poring over labels at the grocery store, trying to determine the healthiest options? What makes one box of cereal better for you than another, and how are we supposed to decipher the extensive lists of mysterious ingredients on every package, and then determine whether they are safe or toxic to your family's health? With nearly 40,000 items populating the average supermarket today, the Rich Food Poor Food - Grocery Purchasing System (GPS), is a unique guide that steers the consumer through the grocery store aisles, directing them to health enhancing Rich Food options while avoiding health detracting Poor Food ones. 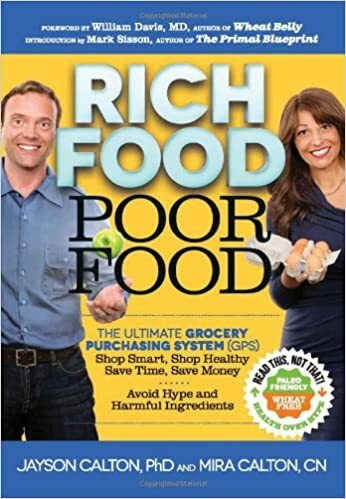 Rich Food, Poor Food is unique in the grocery store guide arena in that rather than rating a particular food using calories, sodium, or fat as the main criteria, it identifies the products that contain wholesome, micronutrient-rich ingredients that health-conscious shoppers are looking for, like wild caught fish, grass-fed beef, raw/organic cheese, organic meats, pastured eggs and dairy, organic produce and sprouted grains, nuts and seeds, while avoiding over 150 common unwanted Poor Food ingredients such as sugar, high fructose corn syrup, refined flour, GMOs, MSG, artificial colors, flavors and sweeteners, pesticides, nitrites/ nitrates, gluten, and chemical preservatives like BHA and BHT. So while other food swapping grocery guides may give the green light to eating Kellogg's Fruit Loops with Sprinkles, Oscar Mayer Turkey Bologna and Hostess Twinkies based on their lower calories, sodium, and/or fat levels, you won't find these heavily processed, food-like products identified as Rich Food choices in Rich Food, Poor Food. That doesn't mean this guide to micronutrient-sufficient living leads readers to a boring culinary lifestyle. Quite the contrary! The Caltons offer Rich Food choices in every aisle of the store including desserts, snacks, sauces, hot dogs, and other fun foods! This indispensable grocery store guide raises the bar on food quality as it takes readers on an aisle-by-aisle tour, teaching them how to identify potentially problematic ingredients, while sharing tips on how to lock in a food's nutritional value during preservation and preparation, save money, and make homemade versions of favorite grocery store staples. Regardless of age, dietary preference or current health, Rich Food, Poor Food turns the grocery store and farmer's market into a micronutrient pharmacy--filling the shopping cart with a natural prescription for better health and longevity.